The Clonoe ambush happened on 16 February 1992 in the village of Clonoe, County Tyrone, Northern Ireland. A local Provisional Irish Republican Army (IRA) unit was ambushed by the Special Air Service and 14 Intelligence Company at a graveyard after launching a heavy machine gun attack on the Royal Ulster Constabulary (RUC) base in Coalisland. IRA members Peter Clancy, Kevin Barry O’Donnell, Seán O’Farrell, and Patrick Vincent were killed, while two others escaped. An SAS soldier was wounded in the operation. S.A.S KILL 4 IRA MEN WHO ATTACK COALISLAND POLICE STATION. Shot by undercover British Army (BA) members, in the car park of St Patrick’s Roman Catholic Church, Dernagh, near Coalisland, shortly after he had been involved in gun attack on Coalisland British Army (BA) / Royal Ulster Constabulary (RUC) base, County Tyrone. From 1985 onwards, the IRA in East Tyrone had been at the forefront of a wide IRA campaign against British military facilities. In 1987, an East Tyrone IRA unit was ambushed and eight of its members killed by the SAS while bombing an RUC base at Loughgall, County Armagh. This was the IRA’s greatest loss of life in a single incident during the Troubles. Despite these losses, the IRA campaign continued unabated; 33 British bases were destroyed and nearly 100 damaged during the next five years. The SAS ambush had no noticeable long-term effect on the level of IRA activity in East Tyrone. 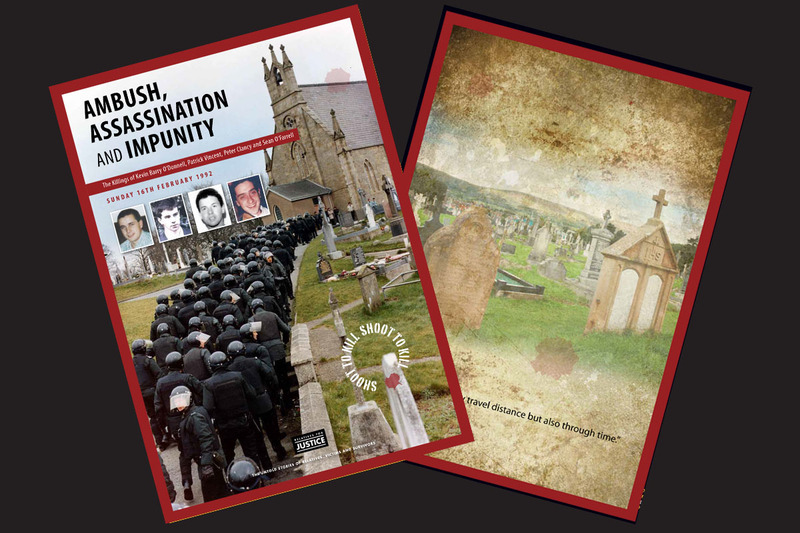 In the two years before the Loughgall ambush the IRA killed seven people in East Tyrone and North Armagh, and eleven in the two years following the ambush. On 3 June 1991, three IRA men, Lawrence McNally, Michael “Pete” Ryan and Tony Doris, died in another SAS ambush at Coagh, where their car was riddled with gunfire. Ryan was the same man who according to Irish journalist and author Ed Moloney had led the mixed flying column in the attack on Derryard checkpoint on the orders of IRA Army Council member ‘Slab’ Murphy two years before. Moloney, who wrote A Secret History of the IRA, reported that the IRA East Tyrone Brigade lost 53 members during the Troubles — the highest of any “Brigade area”. Of these, 28 were killed between 1987 and 1992. On 16 February 1992 at 22:30, a car and a truck carrying a number of IRA members drove into the centre of Coalisland and stopped at the fortified RUC/British Army base. The unit opened fire on the base at point-blank with armour-piercing tracer ammunition. They had mounted a heavy DShK machine-gun on the back of the lorry. The machine-gun was manned by Kevin Barry O’Donnell. The two vehicles then drove up the Annagher hill and drove past the house of Tony Doris, an IRA member killed the previous year. There they spent the last rounds of ammunition firing in the air and shouting, “Up the ‘RA, that’s for Tony Doris!”. The IRA unit was intercepted by the SAS at the car park of St Patrick’s Roman Catholic church in Clonoe. The unit was trying to dump the truck and escape in cars. The roof of the church was accidentally set on fire after a stray round hit a fuel storage tank. Three of the dead were found around the truck, while the fourth was caught in a fence outside the church grounds. The machine-gun had been partially dismantled. At least two IRA men got away from the scene, but the four named above were killed. One SAS soldier was wounded, as was Aidan McKeever, the IRA getaway driver. Several witnesses claimed some of the IRA volunteers were trying to surrender but were summarily executed by the SAS. McKeever was awarded ₤75,000 in damages in 2012 by Mr Justice Treacy of Northern Ireland’s High Court. It is unclear if this decision was appealed or if the damages were ever paid. The gathering of so many men at the same place after such an attack was another factor in the getaway’s failure. During the funeral services for O’Donnell and O’Farrell in Coalisland, the parish priest criticised the security forces for what happened at Clonoe church, which led to the deaths of the four men. The priest, Father MacLarnon, then appealed to republicans to replace “the politics of confrontation” with “the politics of cooperation”. While Francis Molloy, a local Sinn Féin councillor, walked out of the church in protest, leading republicans Gerry Adams and Martin McGuinness remained in their seats. There were many armed RUC officers outside the church during the funeral, the RUC having changed its policy after the Milltown Cemetery attack. This show of force was criticised as it “ensured new young recruits to the IRA”.